Ralph Kiggell, the maker of magical woodcut prints in the Japanese style, lives in Bangkok and I am prepared to believe that Snowdrops are in rather short supply in Thailand. In a recent email, he asked whether ours had made an appearance yet. Detecting a note of ‘(original)home sickness’, perhaps, I took a few photographs. Above is the rather obvious ‘woodland covering’ picture but here is one I rather like . 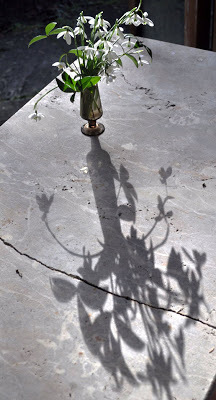 . . especially as Ralph quite often, in his prints, makes a feature of long shadows! 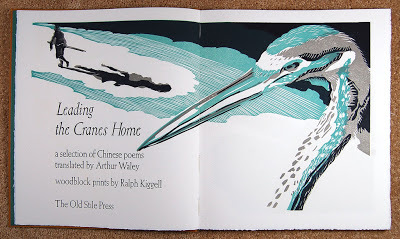 Here, for instance, is one long shadow on the title page of his exquisite book, Leading the Cranes Home. This is one of the most popular of our recent books and, I confess, I do have my favourites! For many months now, emails have been flying between Thailand and Wales as plans for the ‘sequel’ (ie same format) developed. 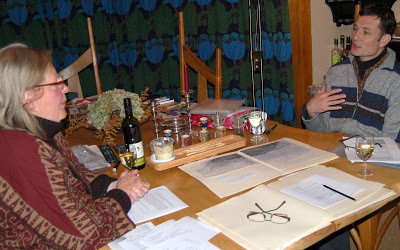 It was decided, when we last met, that the theme for the new book would be “Water” and Ralph has now (I think) completed his selection of poems and prose extracts and, a few days ago, an email arrived containing photographs of an exciting first harvest of newly cut blocks. 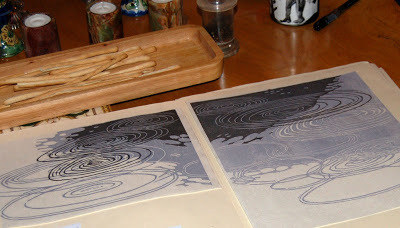 A book which is to contain such an exquisite woodblock print as this, needs watching, I feel. 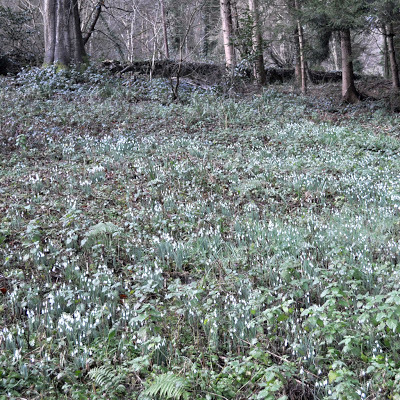 And your snowdrops photo achieves something that Hockney's giant "sous-bois" fail to do (in his current RA show). See you-all this weekend at the Museum.